고객이 공개한 그들의 성공 스토리를 만나보세요! 이 섹션에 계속해서 새로운 스토리가 추가되도록 노력하겠습니다. 저희와 함께 일했던 회사들의 몇 가지 비즈니스 사례 연구를 소개합니다. Caribbean Joe is an American vision of comfort, ease, and relaxation. It’s a lifestyle brand that offers timeless, easy-to-wear products that reflect this warm and genuinely relaxed way of life. Caribbean Joe’s equity lies in its perspective – providing ideal essentials for confident men and women – full of powerful colors, one of a kind prints, unique embellishments and innovative fabrications. ARBITRAGO (heritage of Reliance Brand Management) was engaged to expand the brand into the Asian market, with Japan set to be the first country. ARBITRAGO identified and introduced the Caribbean Joe team to key executives of Minoya and negotiated the deal. Minoya is a leading apparel manufacturer in Asia, distributing more than 20 million units annually. In 2013, Caribbean Joe product was launched in 310 Aeon Stores, through Minoya. Aeon, founded in 1798, is one of the largest retailers in Asia, with 590 general merchandise stores as well as 222 shopping centers. AFFLICTION Clothing was launched in August 2005 into a lifestyle brand and while the company has deep roots in the MMA community, its “Live Fast” motto represents and appeals to audiences who appreciate a variety of disciplines and eras such as Rock & Roll, Moto Culture, Tattoo, Vintage Americana, Mixed Martial Arts (MMA) and Impact Sports. In addition to the Affliction brand, the company also produces labels American Fighter, Archaic, Rebel Saints, Sinful, Throwdown, and Xtreme Couture. The founder of ARBITRAGO was hired to strategically plan and launch Affliction and Sinful brands into non-apparel categories to enhance brands’ image. The best-in-class licensees were identified domestically and then agreements were negotiated and executed, keeping her help instrumental in establishing product approvals and compliance monitoring process, marketing and product approvals – working alongside with the key executives in their business development strategy. 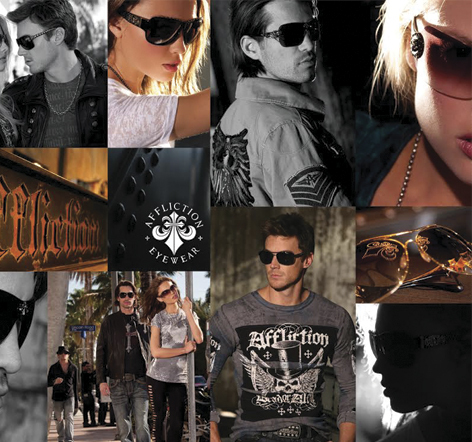 In one year, Affliction and Sinful established 10 executed agreements for soft- and hard-line licensed categories. International sales of licensed merchandise doubled in Canada, Russia and the CIS countries, Australia, and Mexico.